Outlet Mall Shopping- Is it worth it? 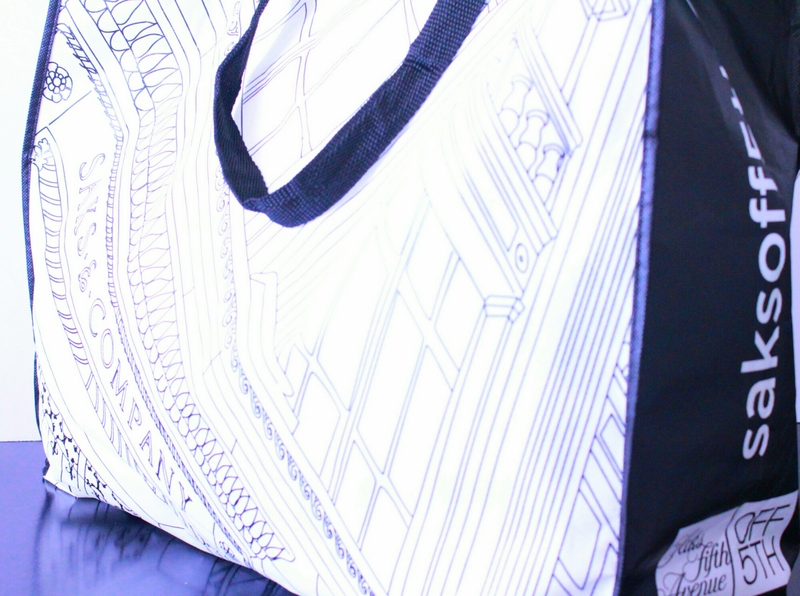 Saks off 5th Avenue bag filled with outlet purchases. I love to shop. I also love a bargin. I am the prime candidate for outlet mall shopping: I get my fix but for less and that makes me feel so satisfied. It’s no secret that outlet malls have become increasingly popular. The mere fact that there are now entire malls dedicated to it is testimony to this. You go out to these clusters of high end stores and pick over their merchandise which you purchase for a fraction of the price. You walk away feeling smug because you’ve one upped everyone paying full price in the department stores, you’ve really stuck it to the “man”. Until someone tells you that your purchases aren’t the REAL thing but rather lower quality knock off. This is a not so well known claim : that many outlet stores indeed manufacture lower quality items under their brand and sell them at “discounted” prices tricking us fools into thinking we’ve found the deal of the century when in fact we’ve been scammed. Let’s examine this by starting from where else? The beginning. The concept of the outlet mall bagan a few decades ago, right around the same time consumerism became a way of life. Big department stores and clothing brands wouldn’t sell all their merchandise for one reason or another and it would be scooped up from all the different branches and sent to one obscure warehouse where they were sold off for next to nothing . This was the time of innocence for the outlet store. If you wanted this kind of bargin you had to be willing to drive to this location and sift through the good the bad and the ugly to get that steal of a deal. This was a great thing. Companies got to recoup some money on their items and consumers got their bargin. As one would imagine something like this would eventually gain popularity. Why pay $200 for a jacket now when you could get it for $20 next year this time? Well it would seem that the volume of customers hungry for a bargin became too tempting for some companies to ignore. The rumor is that companies, realising the kind of profit they could turn started making cheaper items and selling them at low cost. The consumers were still happy. They got theit brand name bags and shoes and still had money left over to go out. The companies were very happy. They made more profit. Somewhere, someone, some years ago realised this wasn’t making sense. They figured that companies stood to profit way more by passing off lower quality items as reduced price items and making a killing. What started as a very quiet unsure whisper is now more of a murmur and it’s getting louder. There are many people who state it as fact that all outlet stores are selling “fake” items. Absolutely. The goal of any business no matter size or shape is to make a profit. As much of it as possible. According to information (cannot attest to the validity) some companies make as much as 60% of their revenue off outlet sales. Unfortunately and it’s quite easy to see how companies might opt to do this. This is where it gets sticky. Is it wrong for a company to make a slightly lower quality item (still good quality mind you) and sell it at a more affordable price? NO. In fact many companies do a similar thing. For example PINK is a more affordable line in VS aimed at teenagers and girls in their early 20s. Old Navy is like a cheaper (more fun, less preppy) version of The Gap which is the little sister of the more sophisticated Banana Republic. All three have the same ownership with some very similar designs and likely produced in the same factory, yet they have three distinct price points. However, what IS WRONG is cheating people. Most persons belive that outlet stores are still what they began as. A place where unsold and unwanted high end merchandise goes to retire. The fact that massive billion dollar companies would market their items as one thing when in fact they are something else, is loathesome, and this is what stings most people. 1) Put simply, a lot of people just don’t know. Everyone doesn’t read fashion blogs and consumer reports. A lot of people just want a nice handbag at a great price and they aren’t out looking to see if they’re being swindled. 2) The clientele is different. I am not saying there isn’t overlap but often the person who will drive all the way to an outlet mall and rifle through the wrong sized clothing for hours on end to pay 1/3 the price for a belt or coat probably isn’t floating around department stores buying what they have there. If you cater to an entirely different clientele who probably has zero idea what the “original” item really looks like and how much it costs then you can get away with it. Do all companies do this? Since I can’t be 100 % sure any companies do this, I can’t say all do. But it’s hardly likely that from the hundreds of brands who own outlet stores every single one is mass producing lower quality items to pass on to unknowing consumers. It isnt impossible though. I personally believe some do and some don’t. It all depends. To answer this question we have to inflect a bit. Why do we want these items in the first place? Why are we so excited to fork over $200 (still a significant amount of money) for a piece of cloth or a hunk of leather? There are two main answers. 1) It’s all in the name. We want that brand name or famous logo splashed across our belongings. Retail companies realise this and appeal to our vanity by mass producing this stuff so we can pay for their name. 2) Quality. This is something we look for and expect when we pay a certain price or see a certain name. It’s meant to justify the price. A lot of these brands are known for their high quality, hand made items which unfortunately isn’t the case if it’s mass produced. But as I alluded to earlier, many of these companies make both their retail and outlet items in the same factories and they have similar designs. The retail item might have a better quality fabric or use a more expensive zip, buckle etc. So no the two items will not be the exact same thing and yes one will be of higher quality than the other but that doesn’t mean it isn’t still a good quality item. Think of it as a way to own something from a brand you like but within your budget. Remember you get what you pay for. How do I shop at outlet malls? Here are a few tips if you are thinking of doing some outlet shopping with all this information in mind. No one tip is foolproof and can guarantee you won’t be duped but if you keep them all in the back of your head you should be able to maneuver the malls with success. 1) Decide if it matters and how much. After all I’ve just said some people won’t care and that’s fine. For some, like myself I have no problem buying a slightly lower quality shirt but I want a top quality bag so I chose wisely. If you are so paralysed with fear of getting low quality “knock offs” then outlet shopping is not for you. It’s so crazy, it just might work. While some employees might flat out lie in hopes of getting commission from a sale (this happened to me but not at an outlet) many others won’t. There is a good chance the company isn’t going to tell them to lie, they probably just hope you don’t ask. A trick I was taught was to look at the tag. If it gives one price listed as retail price with the price they are offering below it or stuck on as a price sticker then it likely did come from a retail store. If you are considering buying a pair of leather boots from X brand, go into one of their regular stores or go online and see what the stuff looks like. If the boots at the outlet look similar but not quite the same and is in the outlet at the same time it’s in retail then it probably is made for outlet. Conversely if you see a pair that you know for a fact was advertised two seasons ago then you can assume this is the real deal. It was pointed out to me once that the outlet version of a particular brand had a slight difference in the tag. That’s the only place you could really tell but there it was. Sometimes they it’s the type of hardware used, a different shade of a particular colour etc. The volume of clothing and how much of each thing there is. If there are disproportionate numbers of the same style in different colours and sizes that’s a sign thsee are leftover retail items. Whereas if the number of each style of item is voluminous as in the hundreds that’s a clue it was probably mass produced just for the outlet. You know the rest of that saying. If an item normally retails for $2000 and it’s selling for $150, it’s not the same item. The only caveat is if it is severely damaged something you would be obviously aware of. How can you own high end/luxury items for less? Good old fashioned setting money aside until you have enough for the item you really want. That way when you purchase you know you have made an investment in what you really want. I hope this was helpful for the next time you go outlet shopping. Have an awesome day! Say what! $595 US. That is the price of this shoe. On sale! Yes it is a designer brand and compared to the original price its a deal, but come on! Omg! As my New York adventure continues I of course find myself shopping. As one would expect in a city as diverse and glamorous as this there are both dirt cheap bargins and then this! 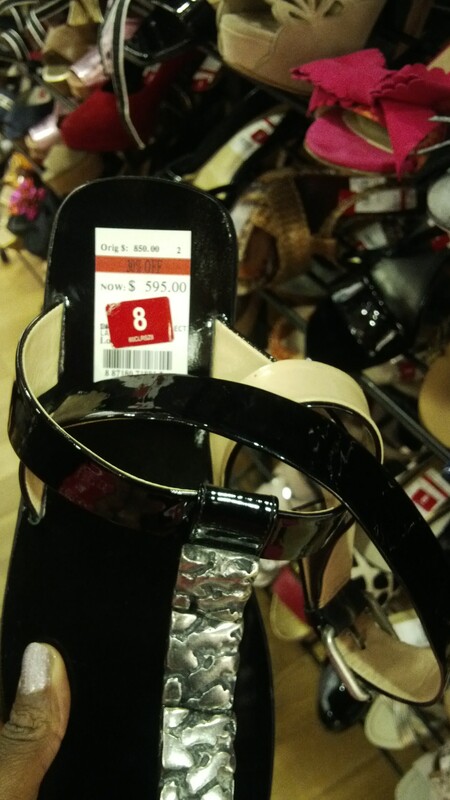 Despite this particular high priced item, the popular department store I was in on this particular day (rhymes with Lacy’s) had a massive sale on originally much higher priced designer shoes. This is how a thrifty poor party girl gains some serious brand items, look for the 2nd most exciting 4 letter word (food being no.1) : SALE! When I go on a shopping trip I would say at least 75% of my purchases are on discounted items in some form or fashion. I will share a few tips that come to mind when shopping for sale/bargin items. Note many of these tips are aimed at avoiding being duped. Most stores keep their sale and bargin items at the back of the store. Hidden away like secret pirate bounty.Let the new exciting fun stuff at the front lure you in but make a beeline for the stuff farthest from the door. This is often where the clearance and 2 for 1 etc items are stashed away. I have found that some stores will hang a similar looking group of items together e.g pink flowy tops priced at $14.95 each. One might safely assume these tops are all the same and so is the price. Wrong, very often there are one or two slightly different looking tops for a totally different price e.g $7.95. It’s almost like if you are willing to work hard enough to sift through everything then you deserve to find the bargin. That’s right, sifting again.This is to prevent the opposite of no.2 from occurring.Many stores will have a rack of similar looking items and items no. 1,2 and 3 cost $5 but no.4 does not and this is the one you pick up of course. More than once I have made my way happily to the cashier to purchase my $5 item only to hear : ” That will be $17.95 mam.” Excuse me! Don’t let it happen to you. This brings me to tip no.4 a similar but different thing to avoid. It’s a cheap mean old trick but it continues to be practiced. Very often a sign will advertise an un believeable bargin with the truth hidden in fine print at the very bottom. Beware of :” $3 (and up) or “$9.99 (on select items) and one of my favourites “1/2 off (on 3rd item when purchasing 2 or more). Despite this trickery, sometimes the deals are still good, you just need to be aware of the exact price of all your items before heading to cash. If you are purchasing multiple items (as we often do) you might not even realise when you have paid more than you intended for something. If no.4 was trickery this is pure soccery. As humans we have the learned belief that items placed on a table or thrown into a bin are on sale. Unfortunately times have changed and the world is not so innocent anymore. Just as we can no longer assume that items on the front shelves of a supermarket aisle are on special we must be wary of anything on a table or in a bin. Very often, very, very often they aren’t on sale at all. In the event that something is on sale, remember tips no.3 and 4. Don’t be ashamed. Couponing isn’t only for the supermarket anymore. Endless stores have coupons that you can pick up online and either print or save the code to your mobile device. Always ensure that the outlet you shop at takes coupons and the one you have is both valid and applicable to your purchase. I have saved tons this way. The point of being a bargin/thrifty shopper is to save. Whether in order to buy more stuff, or to buy that one truly pricey item, because you are broke and in debt, or to keep your savings to a maximum. What ever your reason remember that. Spending unesccesary money (on something you neither need or want) no matter how small the amount adds up. So with all that in mind, go forth and SALE away!